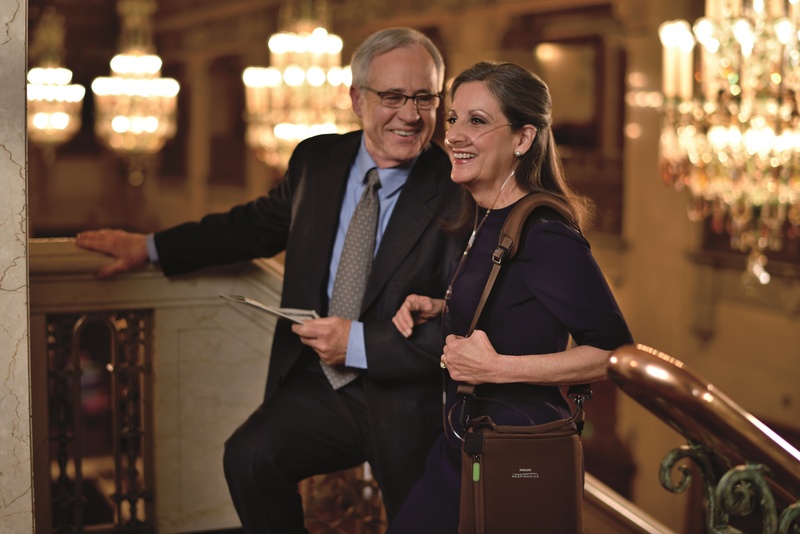 H: 9.4" x D: 3.6" x W: 8.3"
At 5 pounds, the Respironics SimplyGo Mini is one of the lightest portable oxygen concentrator in its class. It offers pulse flow settings 1-5 and stands just 9.4” High x 8.3” Wide x 3.6” Deep. It’s small size means it will never get in your way and is easy to transport. And you won’t have to worry about the SimplyGo Mini ever weighing you down. With a concentrator this small you can give yourself the freedom you deserve and regain your quality of life! 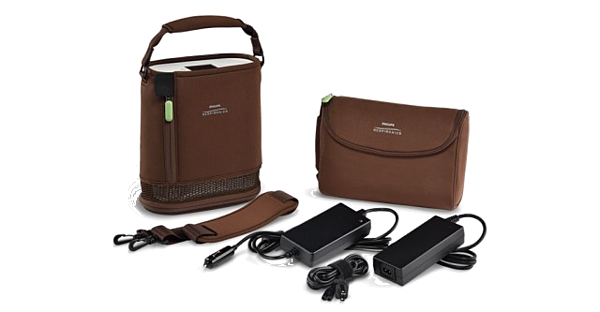 The SimplyGo Mini has two different battery options available; the 8-cell battery and the 16-cell battery. Having the two battery options provides you with the ability to select the battery that best suits your needs for the day. The single battery is the lighter option that gets less battery life. It’s ideal for running quick errands, doing things around your home, and exercising. The extended battery lasts twice as long as the single battery and adds just one pound to your concentrator. It’s ideal for things like traveling, extended trips away from your home, and going out for dinner. 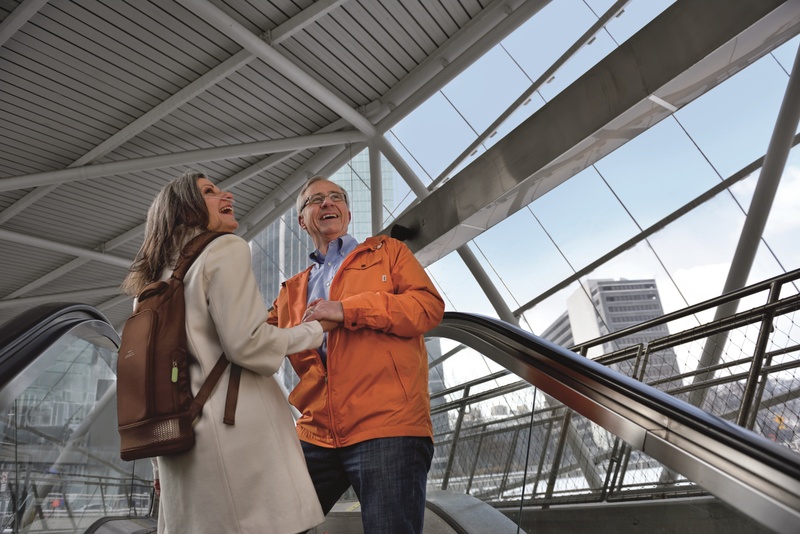 When you are using the SimplyGo Mini, it is extremely easy to carry and requires a minimal amount of energy from you because it is so lightweight. Not to mention, the custom carrying case that comes with the machine is equipped with a padded handle strap and a padded shoulder strap allowing you to carry the concentrator in the way you find most comfortable and convenient. Not only does the custom carrying case provide you with multiple ways to transport your concentrator, it also provides your SimplyGo Mini with an added layer of protection from everyday wear and tear. Operating the SimplyGo Mini is a simple and easy process. It is equipped with a vibrant touch-screen control panel that you will be able to master in no time. The touch-screen has visual cues to help you power the unit on and off, change flow rates, and view past alarms. Recharging your batteries is a quick and easy process. Simply connect your concentrator to the AC or DC Power supplies and your battery will recharge while you use your concentrator. Recharging your SImplyGo Mini batteries is an easy and painless process. There are three different ways you can recharge your batteries; the AC power supply, the DC power supply, and the external battery charger. The AC power supply is equipped with a 110v power cord allowing you to plug it into any standard wall outlet. When the SimplyGo Mini is plugged into the AC power supply your battery will recharge and the concentrator will still supply you with oxygen. 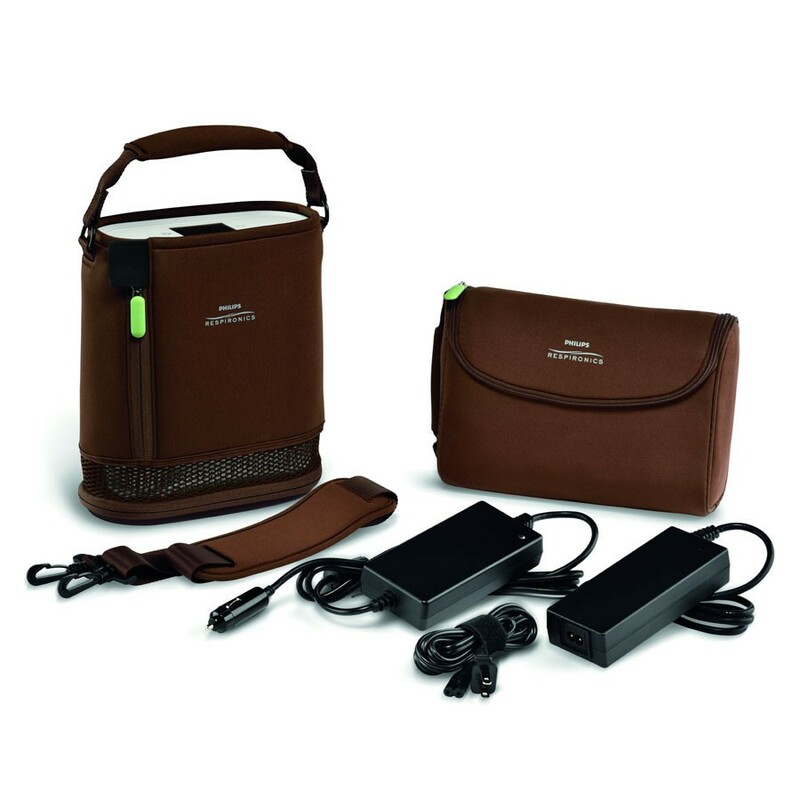 The DC power supply allows you to power your concentrator and recharge your battery on the go. It is equipped with a 12v power cord that plugs into the cigarette lighter or 12v outlet in your vehicle. 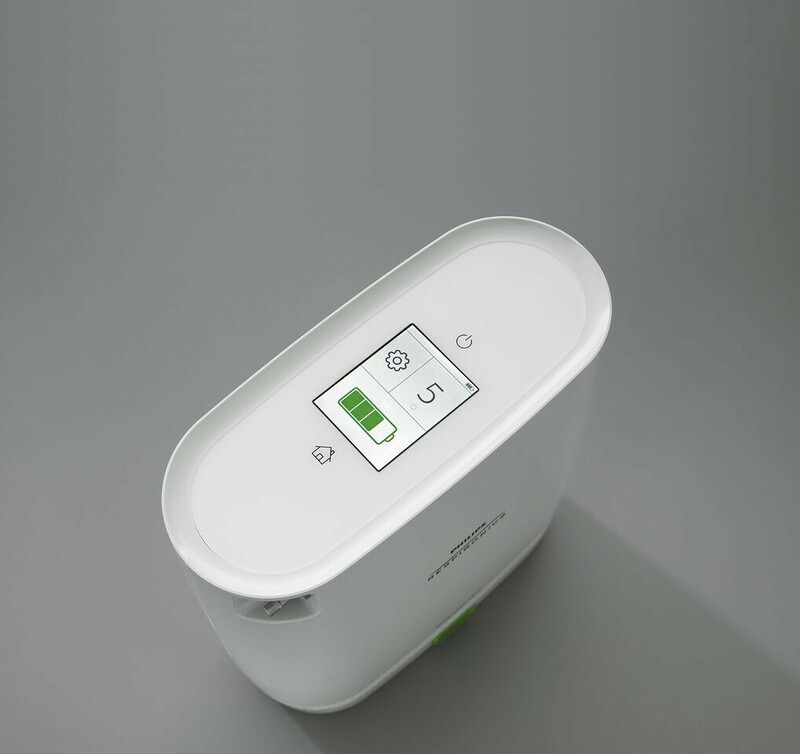 While your SimplyGo Mini is plugged into the DC power supply it is fully functional which means that you can use all 5 oxygen settings and your battery will still recharge. It’s recommended that you use the DC power supply any time you get in your vehicle. That way you can save your battery life for when you need it most. Turning your SimplyGo Mini on an off is as simple as two taps of your finger. At the top of the touch-screen you will see the power button, all you have to do is tap the button twice and your SimplyGo Mini will turn on. 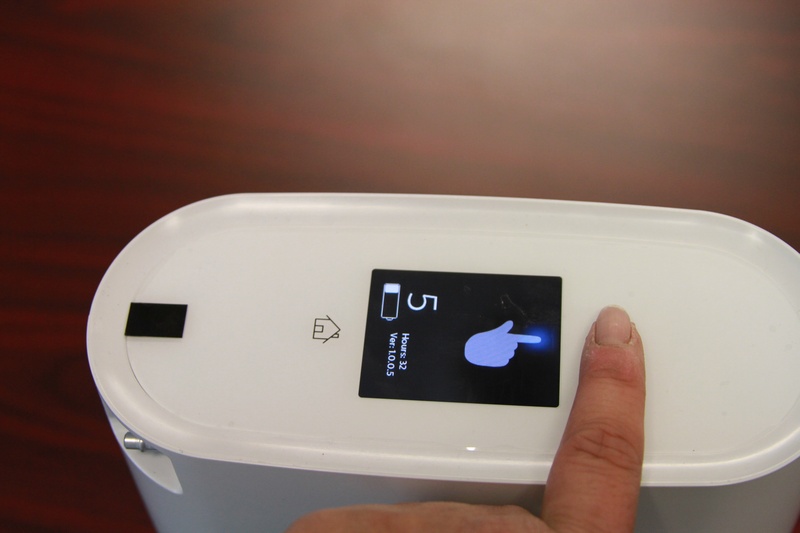 Once the screen turns on you will see the Philips Respironics logo and then the unit will display the home screen which shows battery life, flow rate, and the settings button. You will repeat the same process to turn your SimplyGo Mini off, just two taps of the power button and the machine will begin to shut down. 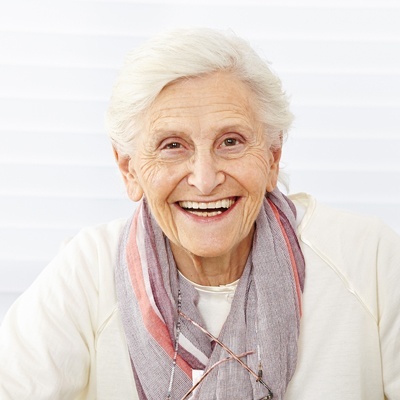 When using supplemental oxygen, it’s important to follow your doctor’s guidelines to ensure you are getting the right amount of oxygen. Adjusting the flow rate on the SimplyGo Mini is a quick and easy process. 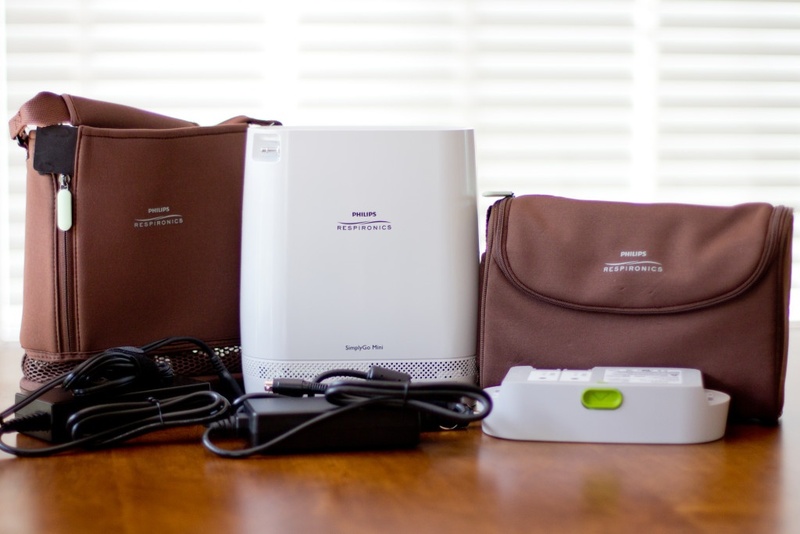 Checking the remaining battery life on your portable oxygen concentrator should be an easy process, and there shouldn’t be any guessing when it comes to how much battery life you have left. The SimplyGo Mini gives you real-time battery life readings on the home screen and it even gets more detailed if you go to the battery screen on the control panel. When you’re using your SimplyGo Mini your remaining battery life will be shown on the home screen. You will see the battery symbol on the bottom of the home screen with 4 bars showing you how charged your battery is. That information alone will suffice for some patients, but if you tap the battery symbol the SimplyGo Mini will pull up a new screen that shows you exactly how much battery life you have left. 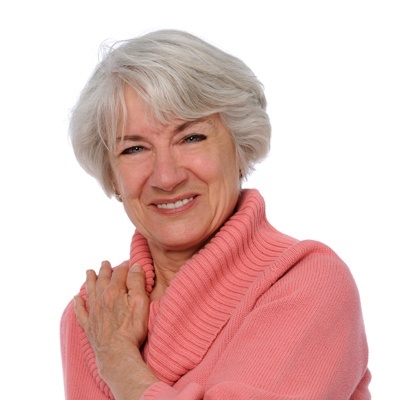 If something goes wrong with your portable oxygen concentrator wouldn’t you like to know what the problem is rather than having to guess and wonder? Well the SimplyGo Mini has one of the most advanced and user-friendly alarm systems on the market. If your SimplyGo Mini alarms, for any reason at all, it will display an alarm notification on the home screen and it will keep a detailed account for every alarm that has gone off over time. You will never be left playing the guessing game again. You can even access the alarm history for your concentrator by tapping the settings button and then tapping the alarm button. This will pull up a screen that lets you scroll through any previous alarms. This is especially helpful if you need to get technical support. It will allow you to tell the technicians exactly what alarm went off, expediting your call and the process that it may take to troubleshoot your machine or send it in for repair. What Comes With Your SimplyGo Mini? 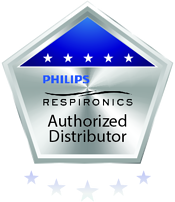 [fa icon="plus-square"] Are you a Philips Respironics authorized dealer? Yes we are! You will notice our badge of approval on this page which notes that we are an authorized dealer. Please make sure any company you plan to do business with has one of these badges for your protection. [fa icon="plus-square"] How much does the Respironics SimplyGo Mini weigh? The SimplyGo Mini is extremely lightweight. With the single (8-cell) battery it weighs 5 pounds. With the extended (16-cell) battery it weighs 6 pounds. [fa icon="plus-square"] How big is the SimplyGo Mini? Weighing just 5 pounds and standing 9.4” H x 8.3” W x 3.6” D, the SimplyGo Mini is one of the smallest and lightest portable concentrators on the market. [fa icon="plus-square"] How long will the SimplyGo Mini battery last? [fa icon="plus-square"] What is the best way to recharge my SimplyGo Mini battery? There are 3 different ways you can recharge your battery and each one is just as effective as the last. You can plug your Mini into the AC power supply or the DC power supply to recharge your battery and use your concentrator at the same time. You can also use the optional SimplyGo Mini external battery charger to charge one battery at a time without having to plug your concentrator in. [fa icon="plus-square"] Is the Respironics SimplyGo Mini FAA Approved? As of right now, the SimplyGo Mini is NOT FAA approved. Respironics has submitted it for testing and the approval is still pending. [fa icon="plus-square"] How long does it take for the SimplyGo Mini battery to recharge? The 8-cell battery takes a maximum of 4 hours to charge. The 16-cell battery takes a maximum of 8 hours to charge. If you are using your concentrator while charging your battery it will take longer to achieve a full charge. The SimplyGo Mini has an operating altitude range of 0-10,000 feet. If you go above 10,000 feet the concentrator’s performance may suffer. 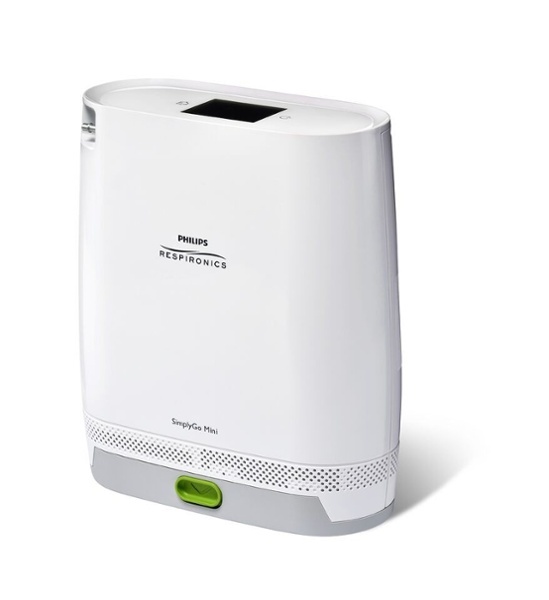 [fa icon="plus-square"] Is the SimplyGo Mini a loud portable oxygen concentrator? Although some people have more sensitive hearing than others, the SimplyGo Mini is a fairly quiet machine. When running on a pulse setting of 2, it registers at 43 decibels which is quieter than a normal conversation, so the sound level won’t be intrusive. Even when the machine is maxed out at a setting of 5, it registers at 46 decibels which is still quieter than a normal conversation. [fa icon="plus-square"] How can I purchase the Respironics SimplyGo Mini? 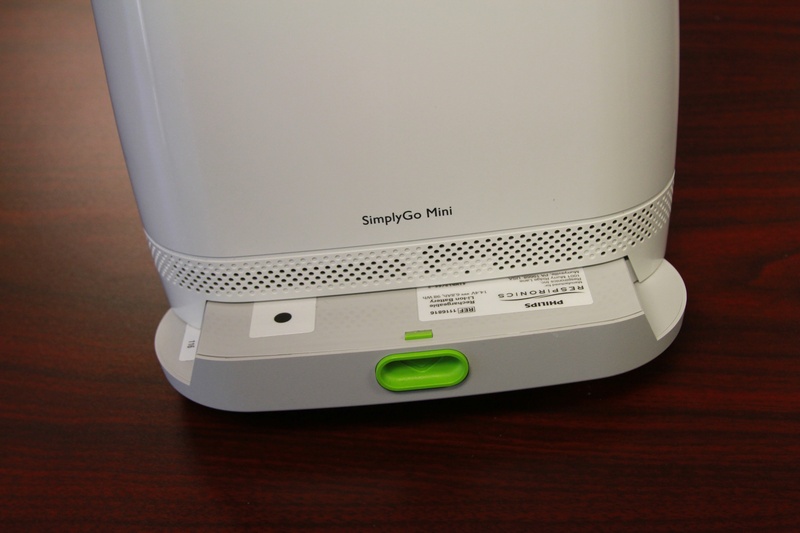 You can purchase the SimplyGo Mini by giving us a call at 1-800-520-5726 and speaking to one of our respiratory specialists. They will answer any and all questions you may have about this unit and they can help you make a purchase.